For more than 35 years Marie-Louise Winbladh was a curator at the Medelhavsmuseet in Stockholm, specialized on the archaeology of Cyprus and Crete. From 1971 until 2001 she was in charge of the famous Cyprus Collections in Stockholm. During all these years she produced exhibitions and organized the work in the storerooms with the many precious antiquities housed in the museum. Marie-Louise has also written several books, been giving lectures, and many other tasks. Her books deal with archaeology, history and religion on Cyprus and Crete during antiquity. For many years painting and sketching was one of Marie-Louise’s main interests. 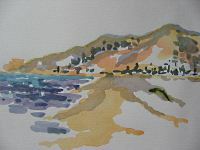 She has mostly found her motifs in Crete, where she have painted at least several hundreds of watercolours. Crete – but also Cyprus – is very beautiful and the scenery often has so brilliant colours that they not seem to be real and almost exaggerated when you are going to paint them. But the one who has been visiting Greece, knows about the strong sunlight, the azure blue sea and the ochre-coloured cliffs – motifs that are difficult to reproduce. Not to mention cascades of red bougainvillea on the white houses in the villages. Or silver-green olive grooves and sweet-scented lemon-trees against the blue-grey Cretan mountains. Along the walls there were palms, laurel-trees and an olive-tree. From the entrance you could smell sweet scented lilies, lavender and anemones, myrtle and fragrant herbs, such as rosemary and thyme. Ivy-leaves were trailing on the walls of the forecourt. On a bench the visitor could relax and listen to the sound of waves from the sea and to the birds singing in the trees. He did not have access to the enclosed area, where there were plenty of statues and statuettes in limestone and terracotta. In the middle a big terracotta bowl with sacred water. There the priestesses had to wash their hands before entering the sanctuary. And there she appeared – behind one of the life-size sculptures. A tall dark-haired maiden, with a wreath of fruit and leaves on her head. She was wearing a chiton, heavy jewellery and was rather made up. The priestess was arranging the votives and the other gifts from the visitors and then she moved aside. Some years ago, a quite unusual exhibition, or rather installation was arranged at Medelhavsmuseet (Stockholm/Sweden). I had always wanted to produce an exhibition, which would attract all the five senses of the modern visitor. The meaning of religion, ancient (and modern) people’s relations to their gods and the physical aspect of their rites are age-less subjects. But it had to be presented in such a way that the visitor would be attracted and inspired to new thoughts and questions. Since Medelhavsmuseet has the most important collection in the world, outside Nicosia, of Cypriote antiquities, it seemed quite natural to try to reconstruct the idea of an open-air Cypriote sanctuary. The storerooms are crowded with all kinds of sculpture, originally set up in the Cypriote sanctuaries as votives. Trees, flowers and herbs, all of the same kind that existed in ancient Cyprus, surrounded our “forecourt”. We know that plants and herbs played an important part in the cults and they also had a symbolic meaning in mythology. Birds and incense were also important elements in the cult. From the earliest periods the principal deity was the great Mother Goddess and the worship of a fertility goddess always remained supreme in Cyprus. She was identified above all with Aphrodite, who was already described as “the Cyprian” by Homer and Hesiod. The museum guards in the exhibition also acted as guides, able to speak about mythology, archaeology, ancient rituals and also something about flowers, herbs and trees. The guides were mostly female, dressed in copies of ancient costumes and jewellery from the museum shop. The exhibition was open for several months, from May until October 1995, and it became a great success. There was a very special atmosphere in the exhibition room. Many visitors sat down for hours, enjoying the scent from the flowers and the restful sounds from the sea. Some of them started to put their own votive offerings in the fore-court, when they noticed that the guides had put offerings of, f ex, dried pomegranates, eggs painted in red colour and dried flowers. When the exhibition had come to an end, four of the six female guards had become pregnant. The blessing of Aphrodite?